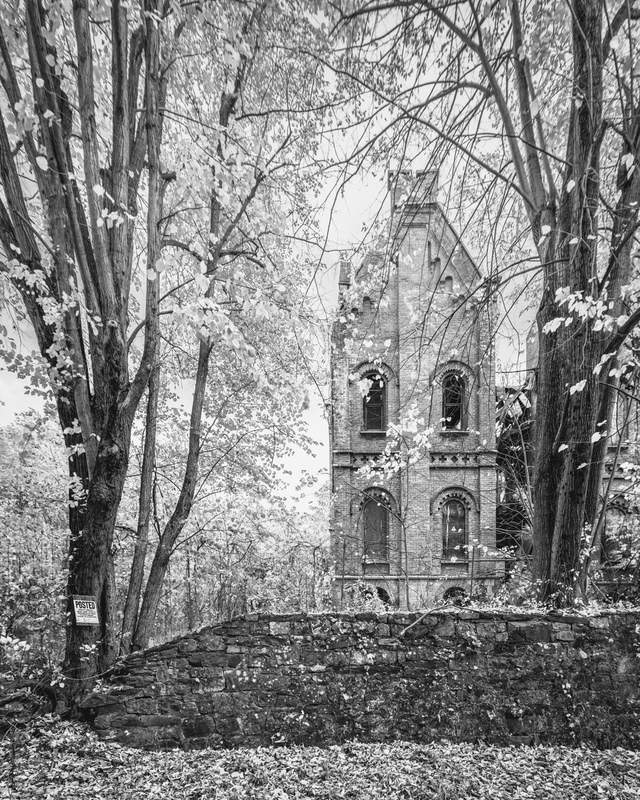 The abandoned Wyndclyffe Mansion broods over the Hudson River in Rhinebeck, New York. Much of what remains of the interior is far too unstable to access, this was taken from a window on the west side of the structure. Three stories of the mansion visible in the curved dining wing of the structure. 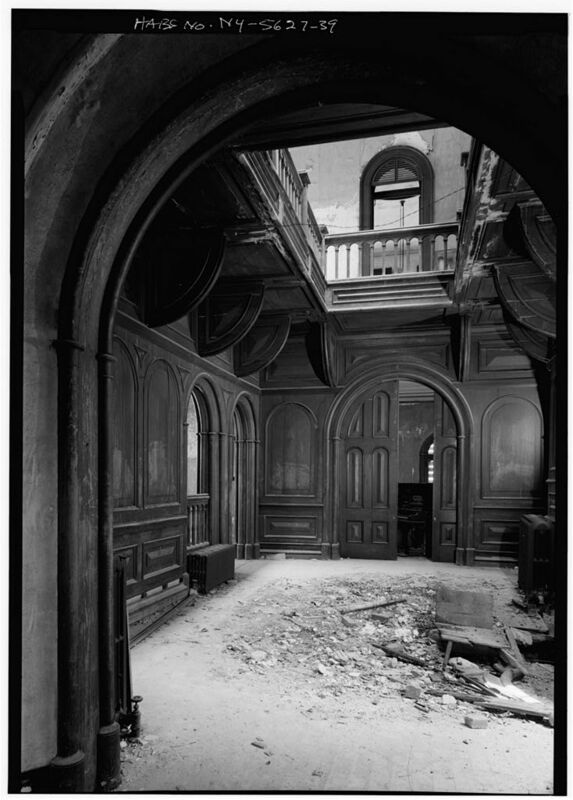 Many of the original architectural details are still visible in a collapsed section of the building, notice the wood detailing in the second floor parlor. Here’s the same room pictured in the 1970s, with the floor already severely damaged by a leaky skylight. The modern eye is likely to be much more merciful to the embattled Wyndclyffe, evil or no. Its beauty is readily apparent, and arguably enhanced, by the extent of decay it has suffered through 50 years of neglect. But how does a house as expensive, distinctive, and historically relevant as Wyndclyffe end up in such a state? 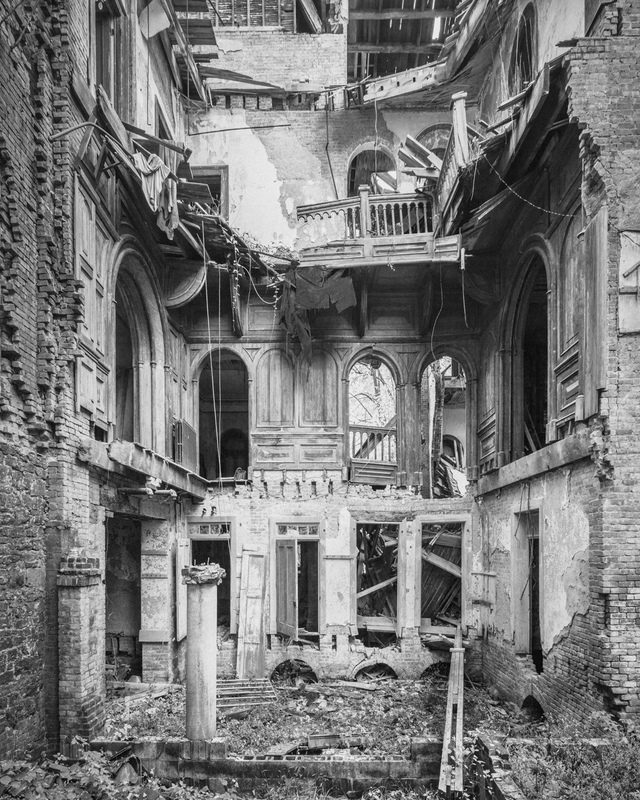 When Elizabeth passed away in 1876, Wyndclyffe was sold to a family who maintained the house into the 1920s, but the succession of owners that occupied the mansion through the Great Depression struggled to keep up with the costly repairs it required. 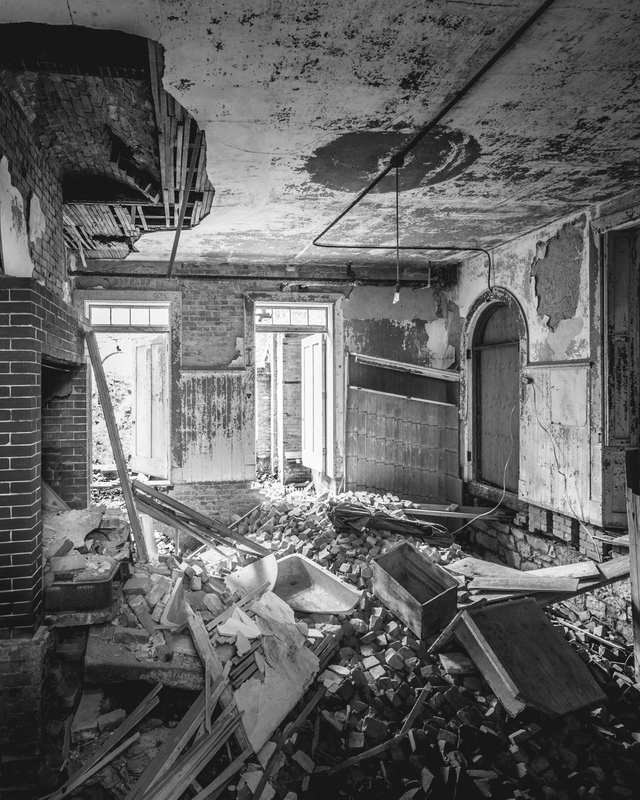 In the 1970s, the house had already been abandoned for decades as the Hudson Valley’s status as a playground for the wealthy declined. At this point, the property was purchased and subdivided, which pared down the grounds of the estate from 80 acres to a paltry two and half. This action more than any other spelled doom for Wyndcliffe—notwithstanding the astronomical expense required to renovate a partially collapsed 160 year old mansion, the lack of land surrounding the structure has made it an extremely difficult sell to potential buyers. 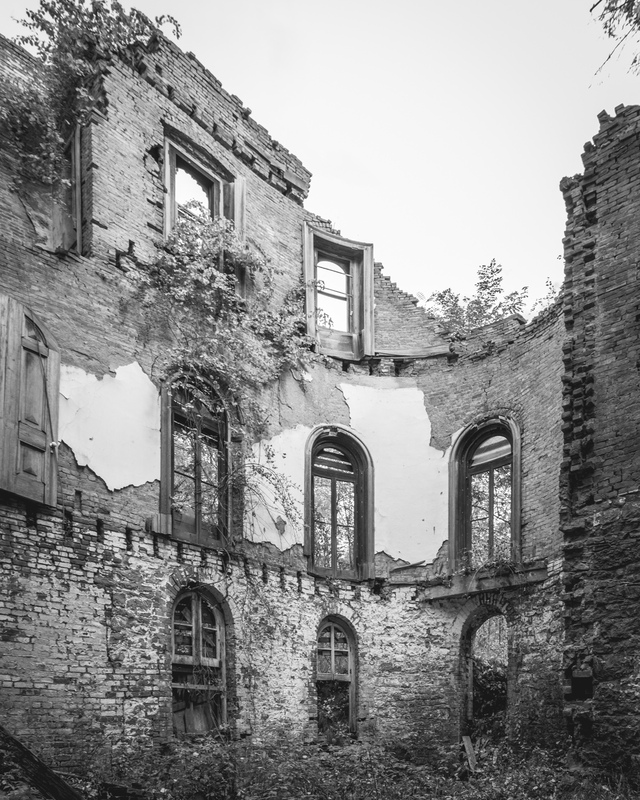 While many nearby estates have been renovated into thriving historic sites after a period of neglect, Wyndclyffe has struggled even to remain standing. 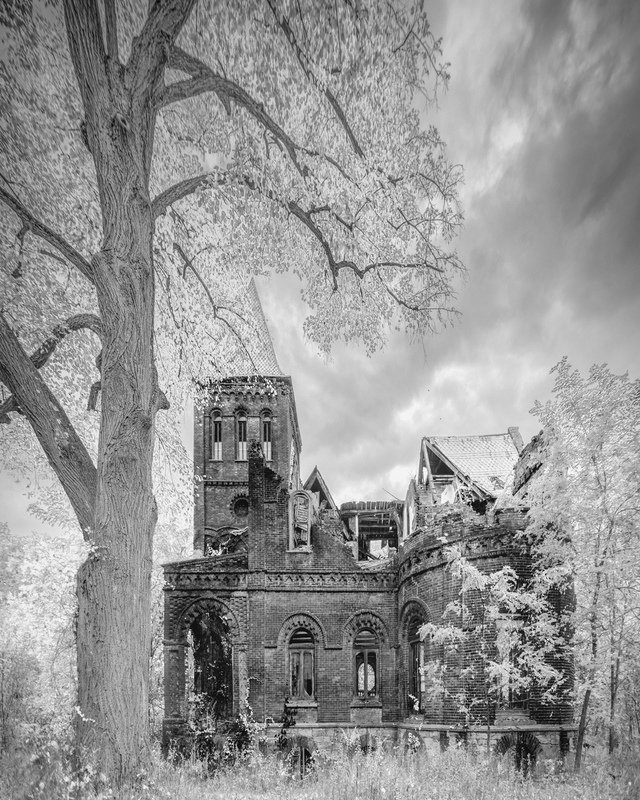 A glimmer of hope appeared in 2003 when a new owner cleared most of the trees and overgrowth from the grounds, erected a fence, and announced plans to save the mansion. But as is often the case, good intentions fade in the face of financial realities. Eleven years have come and gone and the meager improvements are difficult to discern—thick saplings, tangled thorns, and shrubbery completely envelop the structure once again, and the progress of decay marches on. Numerous “No Trespassing” signs are posted around the property. State troopers are often summoned to the site when nearby homeowners alert them to suspicious activity. Since Halloween is just around the corner, I’ll leave you with another eerie passage from Jackson’s “Haunting,” which is said by Stephen King (who should know) to be the best opening paragraph of any modern horror story. It deftly captures the uncanny appeal of empty buildings, and the persistent, however illogical, impression that a house continues to think, feel, and ruminate over its past long after it’s left behind by man. Storm clouds gather over Wyndclyffe Mansion. The entrance to Storybook Castle. Most of these stories don’t hold water, of course, but the truth is nearly as strange. For starters, no one has ever lived in the castle. The facts are few but generally accepted. Construction began in 1907 by a prominent New Yorker and heir to the builder of a famous canal. He transformed a nondescript wooden lodge that already stood on the property into a fanciful fairy tale castle modeled after a Scottish design, cutting corners with local river rocks on the facade but indulging in fine imported marble for the interior. 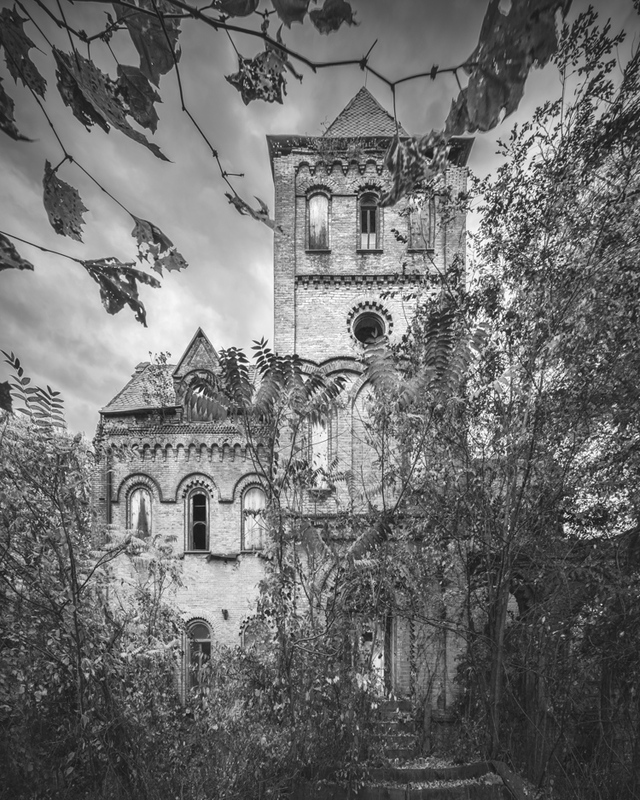 Some say the castle was built out of love for his ailing wife, who suffered from mental illness. Unfortunately, the owner died in 1921 just before the structure was completed. Instead of moving into the romantic hideaway, his grieving widow was checked into a sanatorium shortly thereafter. The couple’s daughter and sole heir ran off to Europe with a new husband, leaving a caretaker to look after the unfinished castle. The courtyard out back is periodically maintained, the lawn appeared to have been mowed recently. In 1949, the property was purchased by the Prince Hall Grand Lodge of the Masonic Order, an African American group based in Manhattan. The original plan was to convert the castle to a masonic home for the elderly, but it was instead used for many years as a hunting and fishing resort. Later, the property became a summer camp for inner-city youth. As far as I can tell, the expansive grounds still serve this function today, though the castle itself has reportedly only been used to creep out campers over the years. There may be no more fertile ground for legends than a summer camp set in the vicinity of a derelict castle. Tales of glowing green eyes, apparitions in white, moving portraits, and self-slamming doors abound. In 2005, the Prince Hall Masons and the Open Space Initiative announced an agreement to protect the castle and surrounding land, limiting future development and prohibiting residential subdivision. Unfortunately, nearly 10 years later, the castle is left completely vulnerable to vandals and exposed to the elements. Though the interior is remarkably well-preserved, several rooms are tagged up with uninspired graffiti. For this reason, I’ve chosen not to reveal the true name or location of the castle, be advised that the building is located on private property. Gothic arches can be found on nearly every window and door of the structure. The kitchen held an antique stove and attractive cabinets. More Gothic arches on the top floor. It’s incredible how the addition of this simple shape can completely transform the feel of the space. Marble spiral staircases are housed in the two towers on either side of the front entrance. Nested arches visible through a second floor hallway. A bit of graffiti mars this otherwise well-preserved room. Many rooms held stone fireplaces, some were intricately carved. The doors were solid and quite heavy, most remained in their hinges. A tower in the garden led downstairs to an underground chamber. An adjacent tower looks out on a view of the creek below. Saplings grow from the gutters but the roof is structurally sound. The kitchen wing looking lovely in late afternoon light.